If your future includes a move to Monte Sereno, check out Meathead Movers! Our professionally trained student-athlete movers, moving concierge, and princess packers are prepared to get you safely moved into your new Monte Sereno home. When you make your move to Monte Sereno, be sure to contact Meathead Movers. No matter what type of moving service you need, our student-athlete movers are ready to handle all your moving needs. Welcome to Meathead Movers of Monte Sereno! If you are moving to or from anywhere in Monte Sereno, we are the moving company for you! Our professionally trained student-athlete movers and our move concierge are here to help you with every stage of your move in Monte Sereno. Located in the heart of Silicon Valley in a rural environment, Monte Sereno is a beautiful and relaxing place to call home. Its strategic location makes it a great place for those commuting to San Jose for work. Despite being in the heart of busy Silicon Valley, Monte Sereno provides the perfect escape for families to enjoy. Originally a rural agricultural community, tranquil Monte Sereno has beckoned many artists, and writers, including famous American Author John Steinbeck. Developed as a strictly residential community, Monte Sereno is perfect for those looking for a serene place to call home. If you are considering a move to peaceful Monte Sereno, you should choose the best Monte Sereno Movers! Our moving company specializes in local, long distance, and commercial moves to, from and within Monte Sereno. We also provide reliable packing, storage, on-site relocations, and our distinctive moving concierge service, which connects you with local service providers. All our student-athlete movers are thoroughly screened and trained before their very first move. With branches not just in Monte Sereno, but all throughout California, we are your one-stop resource for all your moving needs, no matter where your California move takes you. We are so confident in our services, that we even offer a 100% satisfaction guarantee! So, what do you have to lose? 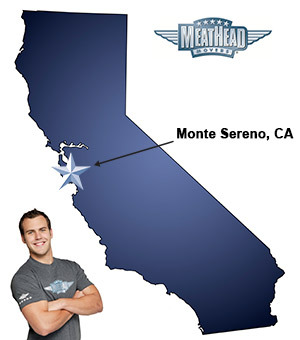 Contact Meathead Movers today for a free moving quote, and learn how we can help you move to your Monte Sereno home. Moving to Monte Sereno? Here are some helpful resources. View more Monte Sereno resources.